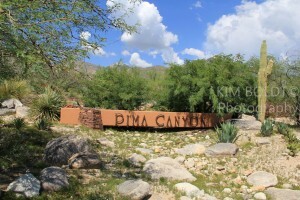 Pima Canyon is a Tucson Gated Luxury subdivision. It is located on the western edge of the Catalina Foothills. Homes have panoramic views of the City of Tucson and the Catalina Mountains. In Tucson, Pima Canyon is considered “exclusive” luxury living. Pima Canyon Estates homes offer owners a range of architectures including Southwestern, Mediterranean and Contemporary. All homes in Pima Canyon are one story and sit on large lots of an acre or more. Pima Canyon Estates is a staffed ated community. Families in Pima Canyon Estates are served by the Amphitheater School District – Amphitheater School District Website. The history of the Catalina Foothills dates back to the early 1920s. Prior to that time, the Catalina Foothills area was primarily federal trust land and open range. Beginning in the 1920s, John Murphey began purchasing property north of River Road in the foothills of the Santa Catalina Mountains. In 1931, residents of the Foothills organized the Catalina Foothills School District to serve the local school-aged population. Murphey sold the school district the land for the first school building near East River Road and North Campbell Avenue, and Joesler designed the first school building. This building continues to house the school district’s administration. Later In 1936, Joesler and Murphey completed the building of St. Philip’s in the Hills Episcopal Church. The church sit at the corner of Campbell Avenue and River Road. The church is widely regarded as a masterpiece of Spanish Colonial Mission architecture. The land for the church was donated by Murphey, and Joesler donated his services for its design. Thinking a move to Arizona is in your future OR a condo for a winter retreat? We can help! Questions about Tucson Arizona Homes For Sale OR Pima Canyon Homes for Sale? Call Us 866 316 5575 OR complete the CONTACT FORM and we will get right back to you!